How to navigate though this website? Navigation of Homepage: This navigation description counts for different navigation bars and tabs of homepage of this website, which includes Top Nav, Cover Nav, Main Nav, Research Nav and Footer Nav. Top Nav: Consists of tabs as shown in screenshot below. Top Nav is located at the extreme top of Homepage. Purpose of this Nav is to enlist proforma items plus links to our social media presence and how to search us on google. Cover Nav: Consists of tabs as shown in screenshot below. Cover Nav is located in the top section of Homepage, just beneath 'Top Nav'. Purpose of this Nav is to keep most attracting, most important to user from our view and which defines and enlists unique features of this website. Main Nav: Consists of tabs as shown in screenshot below. It consists of the access path to all kinds of e-documents published on Nidana Heights til date, under all three linguistic versions and 11 sections of website. For example: In screeshot below, on mouseover 'Introduction' section splits into three language versions sub-menu bar i.e. English, Hindi and Haryanvi. On further mouse over on any of version (English version of 'Introduction' section in screeshot below), it displays all items published under it. Pattern follows the same trend for rest of all sections. Research Nav: Consists of tabs in breadcrumb pattern as shown in screenshot below. Navigation consists of main and most exclusive articles, case studies, reports and analytics published under different sections and versions of this website. This nav serves the purpose of presenting the intellectual work of Nidana Heights group at one place in one window. It is located in below half part of Homepage. Footer Nav: Consists of mainly the regulatory, disclamatory, political statements alongwith Site Map and NH Advisory Board members details as shown in screenshot below. Sub-menu Nav: It consists of all e-documents published under one particular section of one language version. For example screenshot below depicts all the topics covered under English version of Agriculture section of website on light grey horizontal belt aligned left of it. Language Flags: On extreme right of same belt, there are the other than parent language of page language flags. For example screenshot has flag of "India" which indicates "Hindi" and "Map of Haryana" which indicates "Haryanvi", so user can click on either of these to go the Hindi or Haryanvi versions of "Agriculture" section. Similarly user would find "English" and "Hindi" flags on "Haryanvi Language" version of this section on same place. And on hovering the mouse over one flag, it shall display with the text telling corresponding version of website, just like here in screenshot below, "Hindi Version" is displayed on hovering the mouse on Indian flag. Super Sub-menu Nav: Consists of all e-documents published under one particular subsection of a section of one language version. For example screenshot below depicts all the topics covered under 'Discussion' sub-section of 'e-Choupal' section of English version of website. Screenshot of 'Super-sub Nav' of 'Discussions' sub-section of e-Choupal section of its English version. Third Party Links Breadcrumb Nav: It is also called as "Infodesk", usually found first item in right column of almost each page. It consists of third party link which could be very useful to our users. Clicking on any of these tabs will take you to the corresponding website in new window tab. Example: Below screenshot shows a similar Breadcrumb of "Infodesk - Infrastructure". 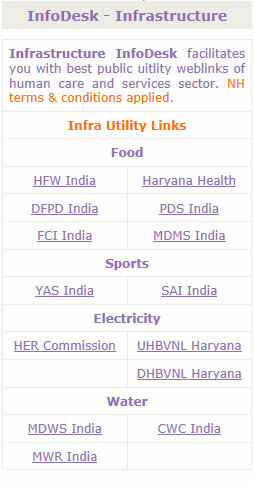 Screenshot of 'Third Party Links Breadcrumb' of 'Infrastructure' section of website. NH Topic Box Breadcrumb Nav:This type of Nav is mainly on pages of extreme right 4 sections of "Main Nav" of website. It enlists all items published under that particular section. For example: Below screenshot shows all the topics published under all there versions of 'e-Choupal' section of website. Screenshot of 'NH Topic Box Breadcrumb ' of 'e-Choupal' section of website.